If only everyone could watch the show through an instagram filter, my props would all be BEAUTIFUL. Rashomon has been in rehearsal for over a month now. You typically don’t hear much about the fall show until late October, because up to that point everyone’s all about the Halloween radio show (Shonte Wesson directed this year and it was AWESOME). Also, the director of the fall show is usually too busy to write blog entries–and let me tell you, right now, Bill Hohnke is the busiest man in Chicago. So I’m going to blog about the Prop Odyssey occasionally, just so the Rashomon tag on this blog won’t feel lonely. This is the third HPCP show I’ve done props for, and the first one where I’ve done props while being in the cast (as the Mother). What kind of journey you have as the props person is very different depending on the show. Musical of Musicals: The Musical! was a parody show, so that lowered the stakes; the shlockier and nuttier the props looked, the more appropriate they became. So it was OK that my approach to, say, building a chandelier suitable for dropping on Junita was to go to Home Depot, browse the shelves, and then get home and improvise. The Marriage of Bette and Boo, being close enough to contemporary times, was easier because most of the props were ordinary household items that could be borrowed from someone, found in my house, or purchased at Target. (The prop that gave me the most trouble was the gravy. I overthought it. The cast solved that problem by using water and it was fine.) There was, of course, the large cake, but I need not have gone quite as all in on that as I did. Medium’s magical bell wand, as best as I could do it. Rashomon is the first time I’ve done props for a period show, and it’s more of a challenge. Vanessa Ellis is the other half of the prop team, and we’ve split it up so that she’s buying what can be bought and I’m making the stuff that can’t be. Like, I could go down to the Oriental Institute and ask them if I could borrow a few of their Heian Period artifacts…but I think I know what they would tell me. Many of these props belong to the Husband, a samurai who naturally has to go around armed to the teeth (Bill bought all the swords, thank God) including with a bow and quiver of arrows that are stolen off his dead body by Tajomaru. 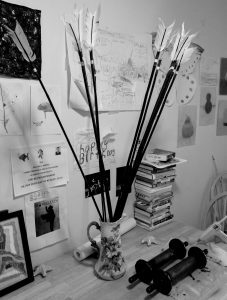 Bill’s got something we can use for the quiver, and I just built a dozen arrows out of stuff I found in the floral section at Michael’s. Pro tip: that decorative bamboo stuff has the benefit of being light, but it is unfortunately also brittle and fragile. It’s like working with Schmendimite. Also, I don’t know exactly how floral tape sticks to itself or why it sometimes doesn’t. But anyway, boom, arrows. The other things you see in my Art Photography here are the rollers for the deputy’s scroll. 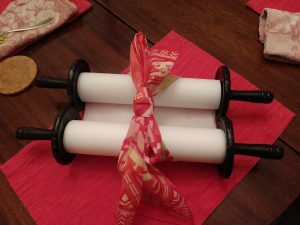 I made them by shoving two cork coasters onto the handles of two cheapo rolling pins and painting it all black. You see the glue gun in the corner there? It is now my friend. Making the bow involved a lot more trial and error. A real bow is made out of a long piece of flexible wood which bends when you put enough tension on it. In the Odyssey there’s this big deal made about how only Odysseus could string his old bow because only he was strong enough to make the thing bend. Well, I don’t know how to find such a piece of wood and if I did I probably couldn’t bend it. I know how to bend wire. I also had a couple wooden rods left over from the package I bought to get the handle for the medium’s spirit-summoning/spirit-chasing magical bell stick thing, which is mostly made of wire and jingle bells and of course my friend hot glue. (It is based on an actual artifact. I just want people to know this.) So between the wooden rods, the wire, some fiberglass insulation I bought because I couldn’t find the pink foam that I used for the chandelier ANYWHERE (until after I was finished and went into my basement for other reasons and found an entire roll of it that I had stored there…alas), a boatload of tape, and some black paint, I made this. From a distance it looks OK. Just don’t anyone try to use it. Also don’t try to use the bell stick to drive away real evil spirits, it is not professional-grade. The bow carried by the Husband, later stolen by Tajomaru. Needs more paint. Once, when I was about 13, I made a film for a school history project. I understood that films used special effects, but I had no clear idea of how that worked. I had it in mind somehow that if I put a wooden boat in the bathtub and filmed it, then when it was projected on screen, somehow it would look like an ocean liner being tossed by the waves during a storm. In fact, it looked like a wooden boat in a bathtub (and you could see the drain, too). Something of that disappointment is inevitable in prop-making; nothing ever turns out as cool as I was imagining it. The scrolls are done now, however, and they came out pretty well. Obviously that scarf is going to have to be replaced with something less…Ann Taylor, but for right now it keeps the whole thing from coming apart. Vanessa found some rope we think will work for tying up the Husband, and soon I hope to get all the stuff I need to build the Sad Rashomon Bonfire. Adam apparently has started on building the prop horse (yes, there’s a prop horse…part of me kind of wanted to go with a Monty Python style panotmime horse, but I don’t let that part of me make real-world decisions).